Cost: $465 for the four day training, including a detailed, illustrated manual, and PDF downloads of the slide presentations. Currently we are only accepting registrations for the entire four days; with a cohesive group, Doug can move more effectively through the materials. On April 21st, registrations for single days will be offered, assuming space is available. This is Doug’s only trip to the Northeast in 2019, and his trainings have sold out for the last few years. Register early! Chronic pain often arises from improper habits and patterns of movement that have become part of the ‘story’ of our body. Traditional approaches in yoga have described the problem in terms of layers or ‘Koshas’ which include the influence of breath, thought and emotion. We are now coming to understand how these ‘layers’ are expressed in the fascia, impacting our well-being while taking a major role in chronic pain. This training will be an exploration of the elements of posture and movement as they express and influence the Koshas, and how to approach yoga practice as a commitment to self-care. We will also look at ‘Marma’ — a tradition mentioned in early hatha yoga texts but not often explored. The idea of marma will be dove-tailed with contemporary body work focusing on the fascia, to give it grounding and relatability. Yoga philosophy will be infused throughout, deepening the connection to the spiritual heart of the practice. • A manual is provided free of charge with the training, which includes the teaching points of the training, illustrated and in detail, with space for you to take notes as we go along. This reduces the stress of taking extensive notes, so that participants can be fully present to experience what is being covered. • In addition, the slide presentations used in the lectures will also be available to download, and can be saved to your computer or tablet as high quality color documents for review. • Each day, beginning on Friday, will begin with an asana practice that incorporates the ideas from the training, so that participants will have an experiential example of how to weave these ideas into classes for the general benefit of ones students. Refreshingly new ideas for practice will also be introduced. • Each day will end with yoga nidra. We will explore the value and importance of the practice, as well as the fundamental principles (from early ‘laya’ forms of the practice) for guiding students simply and deeply into the deep relaxation of yoga nidra. Traditional approaches to therapeutic applications of yoga have focused on the ‘Koshas’ or ‘Sheaths’ of energy. These layers were described functionally, but the more thouroughly we come to understand the functions of fascia, the more clearly we see a practical correlation between fascia and the Koshas. The fascia of the low back provides a definitive example of this. In last year’s workshop, we focused on the influence of the deepest muscles of the spine — the multifidi — which influence the movements of the sacrum, and are a central factor in sacroiliac and low back pain. We will review that material (new students will be brought up to speed), and then build upon that foundation. We will look at the the thoracolumbar fascia as a matrix of interrelated layers that profoundly influence low back health. This has very concrete and practical implications for our understanding of asana and the dynamics of asana. We will be reinforcing and building upon what was covered last year, expanding our understanding of low back health through asana. Our treatment of the low back and hips will also extend down to the knees, with an introduction to understanding knee problems that will be carried forward on the second day of the training. 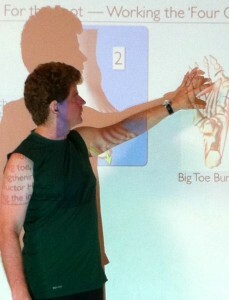 From this perspective we find a constellation of related pain issues that can be handled through simple yoga routines that recognize and respect our own individual structure and movement patterns; and in our practice we will emphasize actions that are important for overcoming and/or preventing such pain patterns. The health of the knee and it’s problems is an especially important topic for active (and previously active) people, and yoga practice itself pose challenges and cautions. For starters, knee health includes all of the major considerations of the lower body: the feet and health of the arches, including challenges such as bunions; plantar fasciitis; hamstring and quadriceps tightness or imbalance; the IT band and imbalances in the many muscles surrounding the hips, including the gluteals. The feet provide the foundation; and the actions of the feet profoundly affect the 3-dimensional movement of the knees as well as the hips. Beginning with the feet, and the fundamental actions for maintaining the integrity and stability of the feet as a foundation, we will apply this understanding in a variety of asanas. From there we’ll expand into assessment principles for the knees and knee problems, awareness of the most common kinds of knee problems and injuries, and principles for safe and helpful practice in yoga poses that will improve the condition of not only the knees, but the feet and hips as well. Just as with the feet, our hands also have arches, and actions practiced to maintain those arches affect the health of the wrists and elbows, and facilitate the opening of the shoulders while protecting the health of the rotator cuffs. This will include self-care techniques based in Marma, which will be a complement to the focused practice of variations in arm and shoulder actions that can be introduced into yoga poses, as well as remedial exercises for improving shoulder health. Pain assessment as well as principles for working with different levels of pain and injury will be included, especially with regard to rotator cuff injuries and related limitations and pain problems arising from the AC joint and collar bone restrictions. The emphasis is on simple actions that can be applied in the poses, as well as self-care exercises related to Marma that can be incorporated into your practice, and used to maintain the benefits of practice. Doug Keller has been teaching workshops and trainings in the therapeutic applications of yoga for a decade, and is known not only for his effectiveness in communicating this ever-evolving approach in these trainings, but also for his extensive writing on the topic in magazines, journals and his two-volume work on ‘Yoga As Therapy.